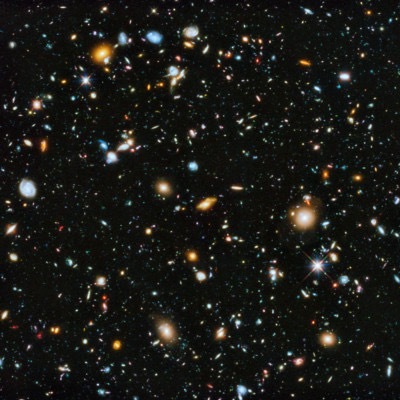 Small Hypothetical Particles Behind Big Bang or No Bang At all? New origin of universe model pours water on Big Bang theory according to recent news from Nature Middle East. A new model in which the cosmos is filled with a “quantum fluid” suggests that there was no Big Bang in the universe. “The Big Bang singularity is the most serious problem of general relativity, because the laws of physics appear to break down there,” says Ahmed Farag Ali, a physicist at Zewail City of Science and Technology, Egypt. When Ali and Das made small quantum corrections to the Raychaudhuri equation, they realised it described a fluid, made up of small particles, that pervades space. In their new model — which will appear in Physics Letters B in February1 — Ali and Das propose that the hypothetical graviton particles, long believed by physicists to generate the force of gravity, could form this fluid. This entry was posted in Education & Research, Technology & Industry on February 14, 2015 by farideldaoushy.